This is a custom set of three knives ordered by one of my best customers and probably the biggest collector of my knives. This is the second custom set of three knives I have made for Mark. This set is based on the customers sketches. We made a couple of changes along the way but the results are pretty true to his original idea. 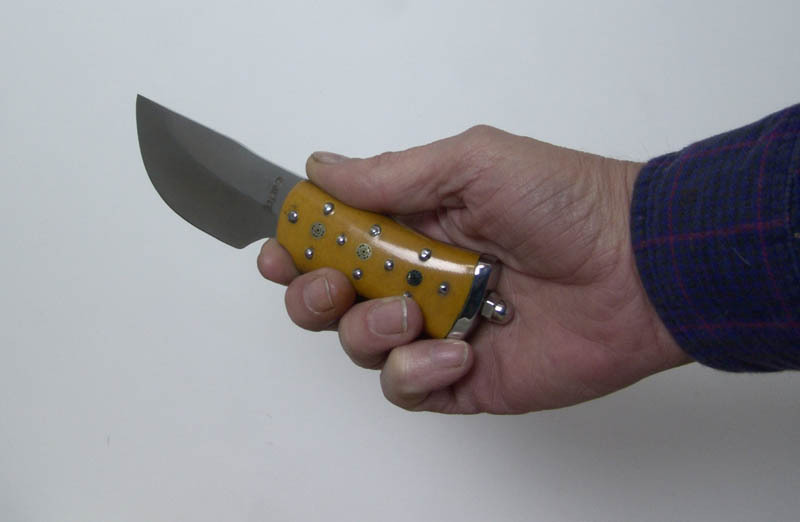 All three knives are made from 440C stainless steel with handles of butterscotch linen Micarta. Each is adorned with domed stainless steel pins and mosaic pins. How did we get here? If you want to see the process scroll down. This project started with drawings provided by the customer. 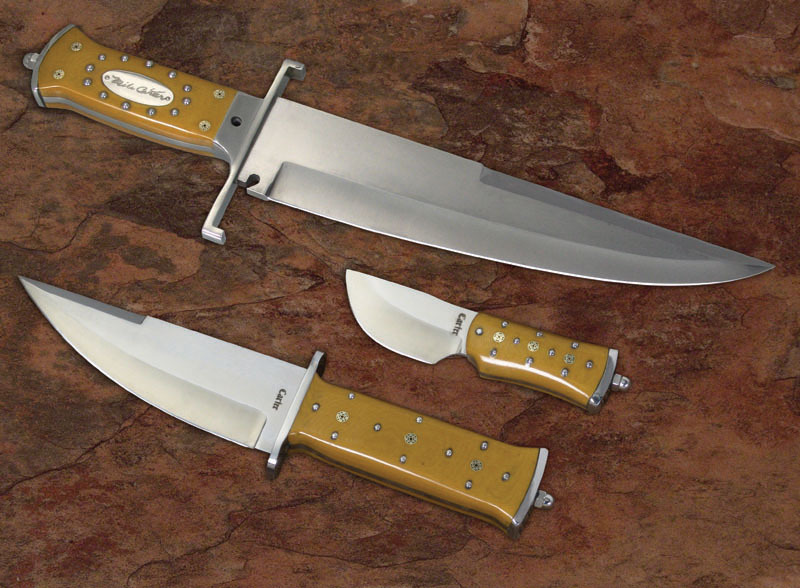 All three knives will have a common theme with butterscotch linen Micarta handles, mosaic pins and domed stainless steel pins. As always, I converted the drawings to Photoshop so I could design and print out full size templates with accurate measurements. 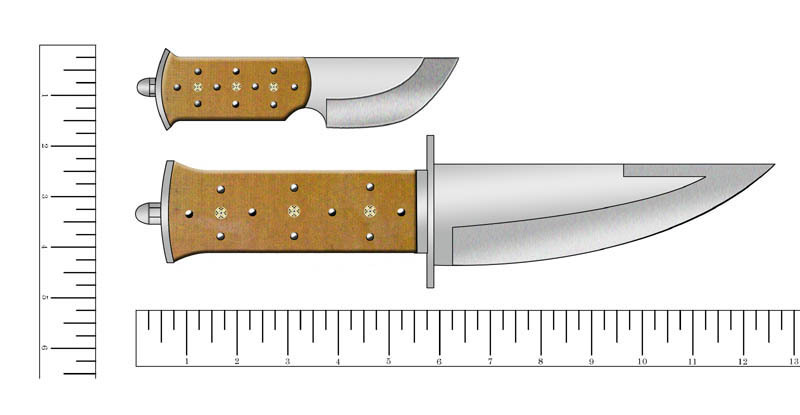 As you can see, we made some changes, most notably adding the stainless steel shield in the handle of the Bowie. The customer honored and flattered me by requesting that I etch my signature on the shield. 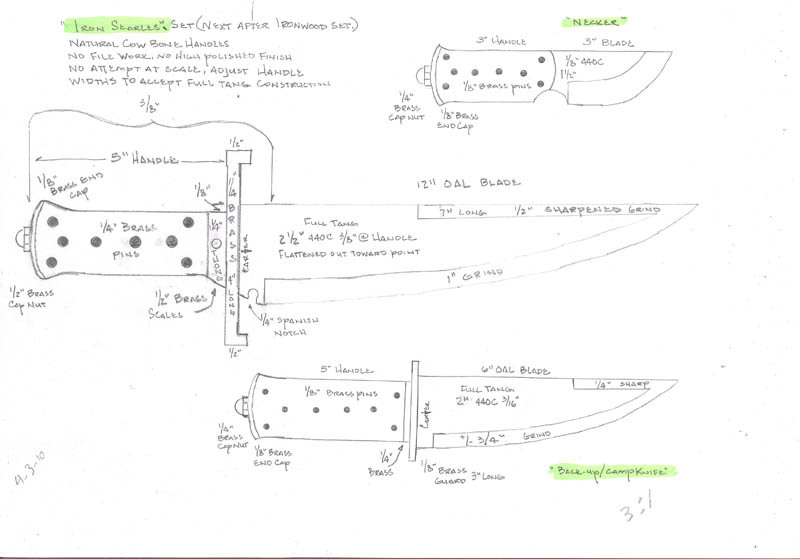 Once we have the design pretty much finalized it is time to start cutting steel. 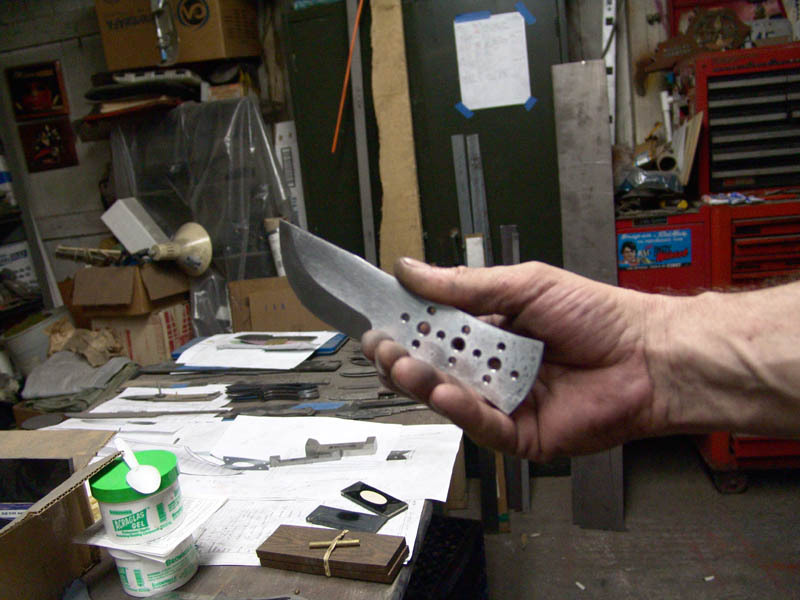 Here the blades are cut, drilled, rough ground and ready for heat treating. 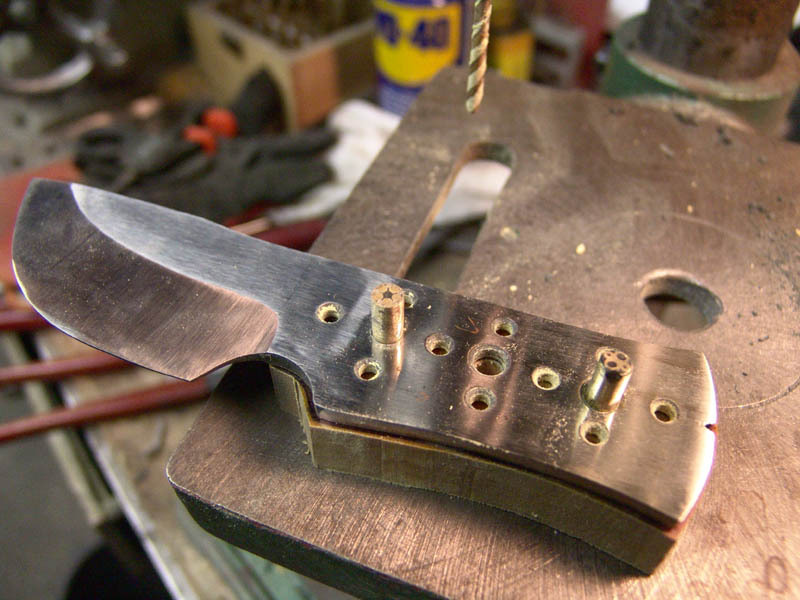 After heat treating, I surface grind again to remove any leftover scale and then do the finish grinds with finer belts. That is followed by a lot of hand sanding on the flats for a hand rubbed finish. 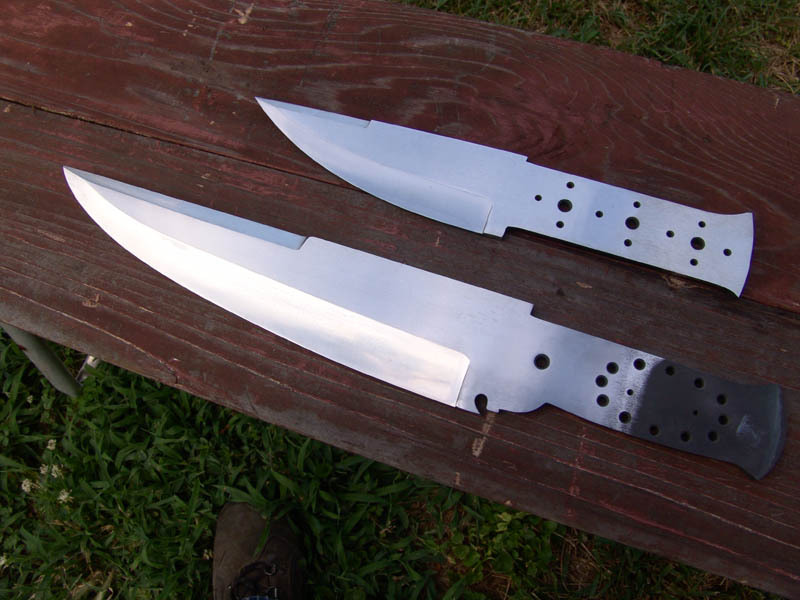 Since the Largest knife was going to be a more complicated build with bolsters and an inlay, I decided to get the two smaller and simpler knives done first. 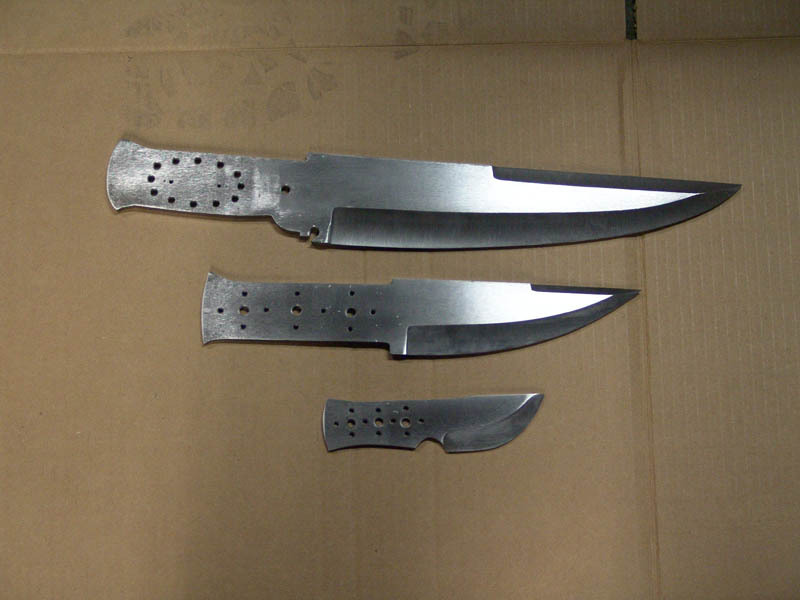 The first one is the smallest of the three knives for this order. 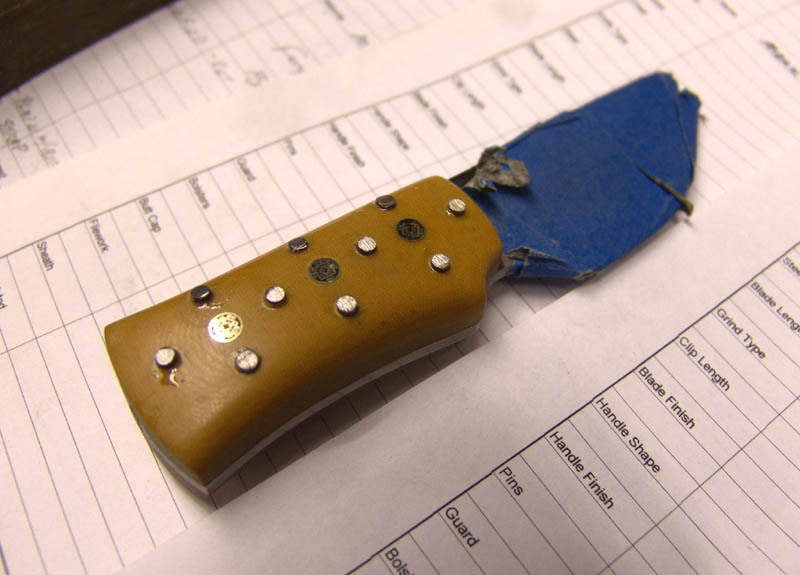 I use the holes in the handle tang as a template for drilling the pin holes in the Micarta and temporarily install pins to align the holes. 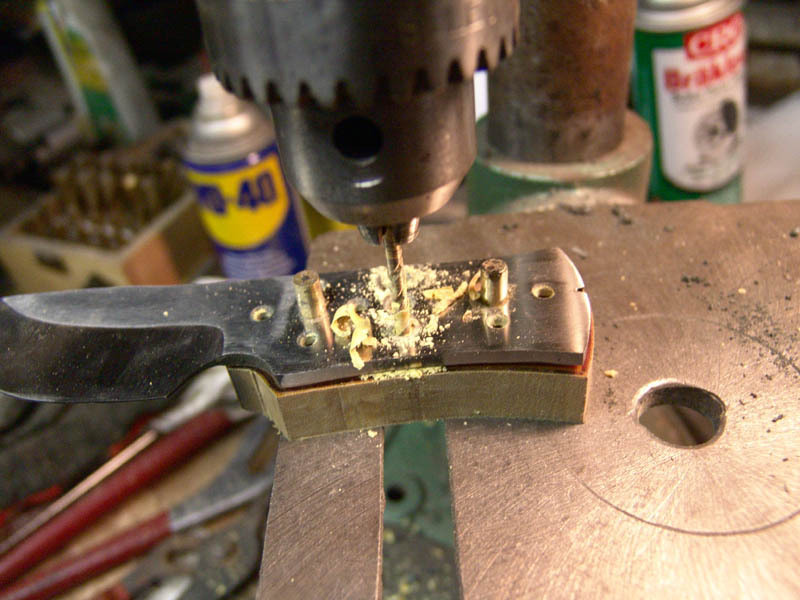 Drilling leaves a little burr on the Micarta the is easily trimmed and sanded down. 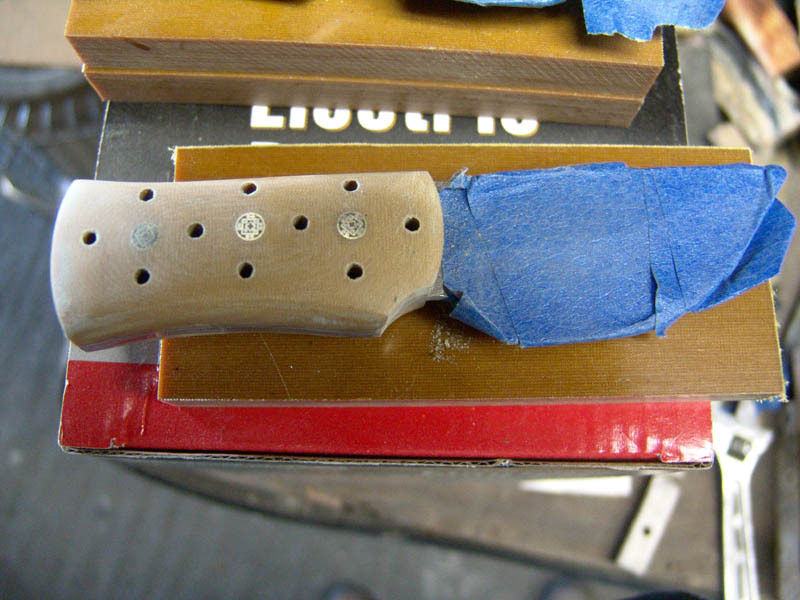 After the handle scales are attached with the mosaic pins I start sanding and shaping the handle. Next I install the stainless steel pins. 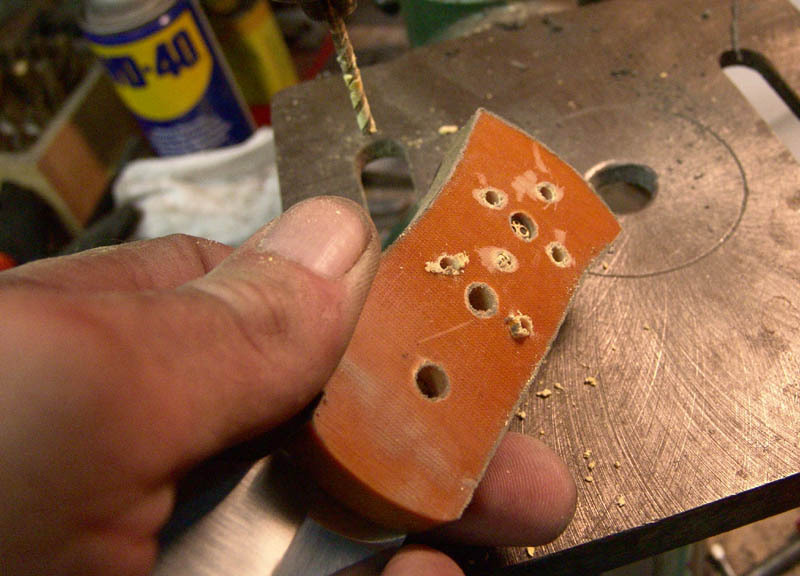 These are mostly for decoration as the epoxy and mosaic pins are more than enough to secure the handles. Next I will dome the stainless pins with a tool called a head spinner. The SS pins have been domed and now I start fabricating the end cap from stainless steel. 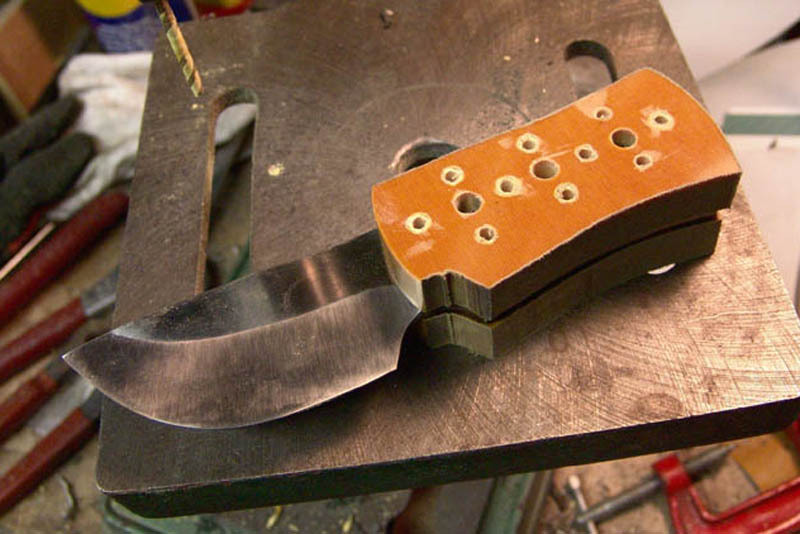 I was tricky to get the curvature just right to match the handle. Number 1 of 3 is finished. That's one down and two more to go!